Maybe you have a gummy smile or maybe your gums are receding. Whatever your issues may be, Dr. Vazquez and his team can help get you on the right path. Look at some of the pictures below and see if these look similar to you. There are several surgical options to enhance the cosmetic appearance of one's mouth. These include procedures to cover exposed roots due to gum recession, cover exposed metal margins of fillings or increase the thickness of thin gingival tissue, procedure which alter the contours of the gingival tissue in order to even out the smile line, or procedures used to reduce bulky gum tissue that is un-esthetic. 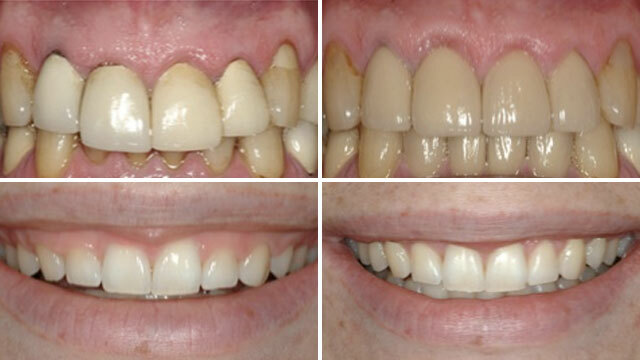 There are a number of operations that can be performed to enhance the appearance of the gingiva to produce a more balanced and harmonious smile. Gingival grafting is one of the more common procedures. There are two types of gingival grafts; a free gingival graft, and a connective tissue graft. 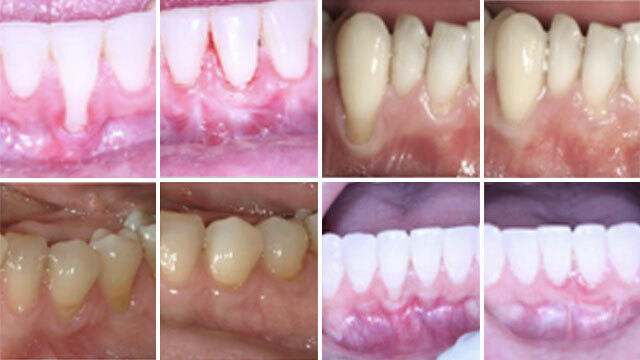 The type of graft taken depends on the type of gum defect as well as the purpose of the graft. Some are used for bringing the tissue back to a healthy state and in preparation for crowns or fillings that a dentist will place. Others are used for esthetic reasons simply to improve the appearance of one's smile. Additional reasons for the grafting include discomfort in the gums during tooth brushing or eating, to repair shallow root decay or root wear from aggressive tooth brushing, to prevent recession because of orthodontic tooth movement (although sometimes orthodontic treatment itself can repair recession and no grafting is needed), and to facilitate self-performed plaque removal. Before and after pictures of patients who have received these grafts are presented below. Clinical crown lengthening is a surgery that is often necessary due to advanced decay destroying so much tooth structure that there is not enough left for your dentist to restore it with a properly fitting filling or crown. The same situation can develop when a tooth has been broken, again leaving insufficient tooth structure to be able to repair it. The Crown lengthening surgery removes gun tissue and bone to expose sufficient tooth structure for it to be restored. Typically, it is necessary to wait approximately six weeks for the gum tissue to heal and mature before you will be able to see your dentist for the new crown or filling. 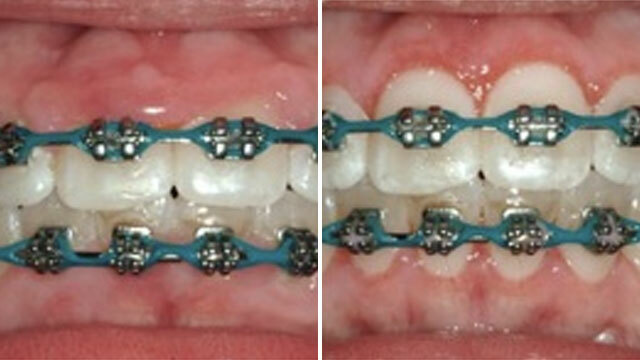 The "before and after" photo are provided to give you an idea of the results you can expect. The gums, or gingiva, can become overgrown around orthodontic brackets, because of a genetic disease, or because of certain medication you take. Once the cause of the overgrowth can be determined and treated, if the overgrowth is still present, the reduction of the gums is recommended for esthetics and hygienic purposes. In the photos below the gums were enlarged due to irritation for the orthodontic brackets in conjunction with poor hygiene. After the gingivectomy, the patient must be diligent about brushing and flossing regularly in order to prevent the gums from overgrowing again.